Outraged badminton fans speak out! Unbeknownst to me and most of the world (the sane world) there is a group of ardent, outspoken, defensive, devoid of senses of humor badminton fanatics... that are outright mean at times. There is no joking about badminton with these people-- it is their religion. I discovered this when I posted a video questioning the validity of badminton as an Olympic event. And for those of you that know me, it was done with a wink. But now it is on! Here is my reaction to their unrealistic reaction. Enjoy. Take a deep breath badminton fanatics and enjoy this one. I'm not too sure if this is a big deal or not. But it is still exciting. 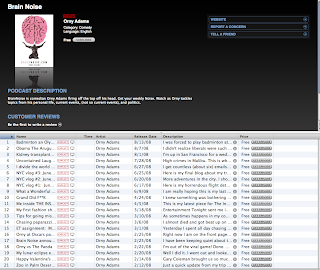 Go to iTunes store and search Orny Adams or Brain Noise and you can subscribe. I was forced to play badminton at camp. I never took it seriously. Never thought it was sport. Is it? I didn't realize liberals were such wimps until I really sat down to think about it... here are my thoughts followed by Obama's latest campaign ad. I'm up in San Francisco for a wedding and to do a benefit for a friend who is uninsured and defaulting on a kidney transplant. Of course my flight was delayed AGAIN. 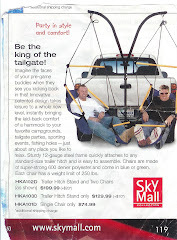 I am now booking myself on airlines that do not charge for luggage. Delta JUST doubled it's fee to check luggage. It is getting absurd. Two weeks ago an airline charged me to use the reading light. ( It is almost getting that bad.) JUST RAISE THE PRICE OF THE TICKETS!